With today's technology, companies and brands can offer a range of different sized TV's for more affordable price tags. Only 10 years ago you wouldn't have been able to have a 55 inch TV in your home theater without the price breaking your bank balance. As each year goes on, they get more advanced and start having features those from the year before didn't have. It's exciting and keeps all of us technology nerds wondering what's to come. Since many people now have the mentality that bigger is better, many families and homeowners want a substantial 75-inch Tv to squeeze into their living space. Those who are savvy and know the best tricks are aware it's never been a better time to buy a 55 inch TV. Why? Because they're the perfect screen sizes for any family home theater, but since they're pretty unpopular, they come at lower price tags than you may expect. Lower budget? Try a 55-inch TV for under $600. What to Look for When Buying A 55 Inch TV Under $1000? 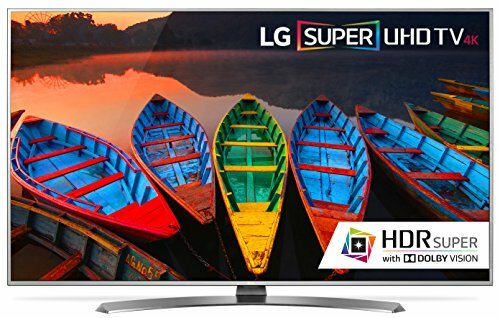 What is the Best 55 Inch LG TV Under $1000? What is the Best 55 Inch Smart TV Under $1000? What is the Best 55 Inch 4K TV Under $1000? Before we go ahead and look at the various factors that affect what 55-inch TV you should buy, we must stress that the more expensive models aren't always the best and the most affordable ones aren't always the worst either. You should keep a look out for the features and elements it has that makes it either a great TV or a terrible one. Below is a buying guide to help you choose the perfect 55-inch smart TV for you, as well as our list of the top 10 best 55 inch TVs for under $1000. If you're not bothered about the size of your TV, but want 4K Resolution you may wish to check out these 4K TVs under 1000 bucks (within your budget!). Offering both excellent image quality and a sleek design, this UN55KU6500 model from Samsung is the ideal budget 55-inch 4K TV for any family. It may be a significant size, but it's not a big price tag. It also has lots of extra smart features and a low input lag for any gamers out there that want to connect their console up to the TV when it's not being used for high-quality movies and TV shows. It's an ideally priced smart TV with a curved screen design that is perfect for those who love to feel involved in the action. It has a modern and sleek design with a center stand which is used to support the weight of the overall unit. If you want to mount your TV to the wall, this is an excellent choice as it's super thin and lightweight. The borders of this model are only 0.71" in thickness which is pretty average, but since they're black, they look sleek and fit into any home theater. It's also a 4K make and has an excellent picture quality; if you're a tech nerd, then you will be able to appreciate the quality of this TV screen. Since it has a tremendous high native contrast ratio and good black uniformity, it allows for movies to look even better than they have before. If you place this UN55KU6500 model in a room full of windows and much natural light, then the performance will decrease, this is because the TV isn't very bright and often can't deal with glare and reflections very well. For a curved TV, the viewing angle is reasonable. But, this TV is poor at handling fast motion blur so if you're wanting to play fast action video games or watch movies that are action-packed, it might not be a perfect choice. Despite this, it's still a good pick and is an amazingly good value for money TV that any family would make use out of. Why We Liked It - Sometimes you have to pay high price tags for good name branded TVs such as Samsung TVs to buy online, but this 55-inch TV model is a great alternative for any family who isn't too bothered about having the biggest TV around. It's still a pretty big size and perfect for movie nights with popcorn so what more could you want! Want a bigger screen? Try one of these 65-inch TVs under $1000. Another better than average Samsung model is the UN55MU8500FXZA. It has a very low input lag and features a curved design which is highly aesthetically pleasing. As well as this, it's a TV the whole family can enjoy because it gets super bright and has a wide range of amazing colors. It has minor flaws and other than a few issues, it's loved amongst so many avid TV watchers. 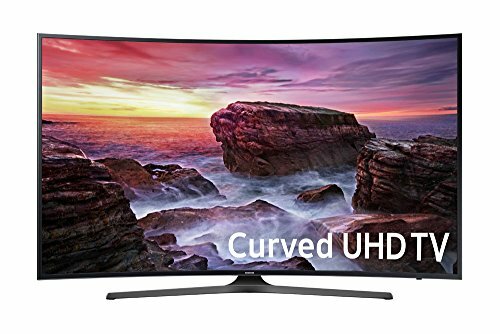 The design of this UN55MU8500FXZA model is curved, but unlike many other Samsung models, it has two-edged legs that help the TV to stand up and be stable. This is ideal for any homeowner or family with small children as sometimes TVs can be very wobbly when they're pushed - but this model doesn't go anywhere! It has amazingly thin borders (coming in at just 0.39") which are metal and feels very high quality. The design is just great overall, and this model looks a lot more expensive than the price you pay. The picture quality is one of the best on this whole list yet this model falls regarding the local dimming, it's quite bad. The local dimming of this model is implemented in vertical zones that span the whole screen which means the screen is brighter towards the edges of the TV screen rather than the middle. This could mean your viewing experience is changed depending on what the screen is showing. Why We Liked It - It has an affordable price, yet it looks super high-end. You no longer have to pay a huge price for a sleek looking TV. It's the perfect balance between class and budget, you don't have to break the bank to pay for it, but you're sure to get a lot of compliments on how nice it is. For any avid TV show watchers, we've found your perfect soul mate. This UN55MU6300 model is a better than average 4K LED TV that has smart features and decent picture quality. If you're a game lover then this might be the perfect gaming TV because connecting your console up to this is a great idea, it has a super low input lag. It might not be curved but it does have a center stand that is metal plated, and the overall design looks sleek and modern so that it can fit right into your contemporary home theater. If you want to mount the TV to the wall, then we would say it's a perfect choice because it's thin and won't stick out too much even near the bottom. Despite the picture quality being better than average as it has an excellent black uniformity and contrast ratio, it doesn't perform as well in a brightly lit room. There is sometimes glare and reflections off the screen if it's placed in a room with a lot of natural light and it performs best when in the complete dark. Which means it's perfect for watching movies in the evening! Why We Liked It - The stand can easily support the weight of the Smart home TV, so there is no need to worry about it being wobbly or unstable. It has a great looking design that is super modern and will fit right into your home theater. Featuring a curved and sleek design, this Ultra HD TV has 4K resolution and opens up the world to a wider accurate color spectrum. It has one remote that can control the satellite, blue-ray player, and TV. So, there is no need to worry about having all the different remotes to control your new purchase. It's great at motion handling so if you want to fill your nights with action-packed movies or TV shows; this is the 55-inch 4K UHD TV for you. It's also pretty lightweight for such a huge TV, so it's ideal if you want to mount it to the wall. Yet, this 4K TV doesn't have 3D capabilities, and some of the smart features do let it down. It's not always possible to have the very best smart features on your TV model, but for such a reasonable price, it's a great find. Why We Liked It - The curved design and auto-depth feature on this 4K TV creates a range of realistic colors and an even more authentic picture for everyone to enjoy. You'll feel as though you're in action with this Ultra HD model of TV. This UN55KS8000FXZA model is another 55-inch 4K UHD TV with a perfect picture and a wide range of colors. It has a low input lag, so you can get the detail when you're playing video games. This 55-inch 4K Ultra HD TV is the perfect companion for every gamer or movie lover. Since it is very bright, it's amazing at handling reflections and glare, so you don't have to worry about natural light affecting the picture quality. Although the design is simple, and it has a wide footprint with the legs standing at both ends of the unit. The chrome finishes it also has a huge bonus as it makes the TV look very high-end, without the price. It's not curved which is a disadvantage if you like to feel involved in the action and the local dimming on this model could be a lot better. Yet, it's still the ideal family TV. It's also ideal if you're a couple who don't want to spend crazy amounts on a TV for their very first home/apartment. Why We Liked It - This 4K Ultra HD TV doesn't have any crazy features that are confusing, and if you don't know a lot about technology, then it's an ideal choice. It has a great picture quality, it looks incredible, and the 4K TV resolution TV can showcase all your favorite movies and TV shows with the click of a button. 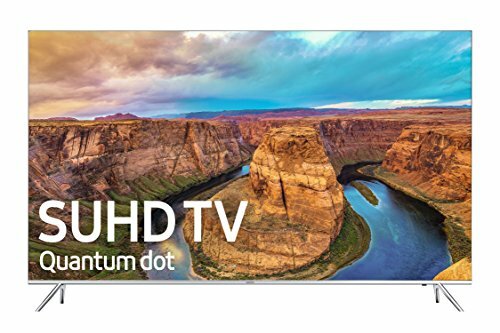 No matter what you plan on using this 55UH7700 4K HDR TV for, it is easy to use and has some great smart features. It also has a super elegant and modern design. Unlike other 4K HDR TV models, it features a curved metallic stand that is thin yet allows the TV unit to stay stable. 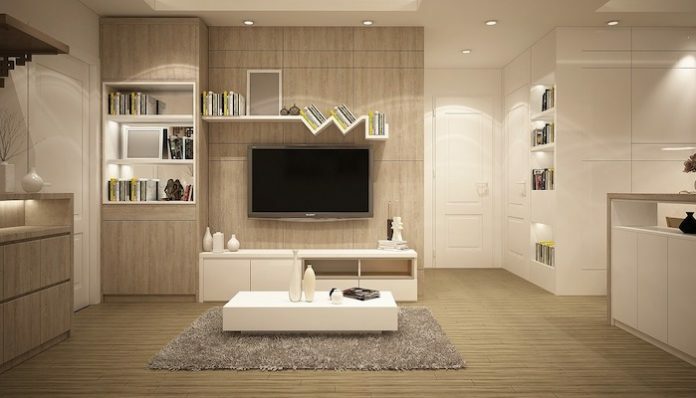 Since the TV isn't curved, it can be hung nicely onto any wall you wish. The borders on this model are pretty standard, they're made of plastic and are of average thickness (0.63"). They still look convincingly metal. Despite being a well-rounded TV with a great design, the picture deteriorates in a dark room, and the 4K HDR could be a lot better. This is due to the poor black level uniformity of this model. The sound quality is also a bigger disadvantage that must be considered before purchasing. We would suggest anyone who purchases this model looks at also purchasing a sound bar or surround sound. Why We Liked It - For something so reasonably priced, this Smart LED TV is still one of the best LG 55-inch TVs to buy. So, if you're willing to purchase it, you've got yourself a great new 4K HDR TV to play about with. Families on a budget love this Smart LED TV simply because it's cheaper than other models. If you're on the hunt for a well-designed TV with overall great picture quality, this UN55JU6500FXZA model might be the perfect pick. It has lots of extra smart features you can make use of, and the design is pretty modern and sleek. It's reasonably priced if you're on a budget, but it's not the best model you can buy. For gamer wanting the perfect TV to play their favorite video games on, this model is ideal as it has an extremely low input lag that will allow your video games to be even better than before. Considering it's a budget TV, it doesn't look like one. The borders are smaller than average, and overall the TV is thin when viewed from the side. It's sturdy and stable, so there's no need to worry about young children pulling the unit on themselves by accident. Yet, an issue is that it does lose a lot of its saturation and HDR peak brightness at wider angles. Why We Liked It - Overall, it's a nice TV. Although it does have its issues, it's a model you'll make use of, and it has a lot of useful features that tend to outweigh the bad. Equipped with an alternative pixel structure for even finer details, the 55UJ7700 model by LG Electronics is a versatile TV with 4K resolution. It's decently bright, and the design is pretty basic, but there are a few nice touches that are sure to impress. It has two-edged legs at either end of the unit which means the footprint of this model is larger than average, but this doesn't affect the good quality of the TV. Unfortunately, it's not curved. But, it does have a low input lag so that gamers can make the most out of this new purchase. Its local dimming feature is also pretty poor considering the price of this model, but there are many issues with the local dimming across LG 4K models. Despite this, it handles motion well and is a nice TV to sit around and watch your favorite shows and movies. Why We Liked It - 4K TVs to buy are mainly about their sound and image quality. But, when you have a TV that can perform well at both of these things and looks great too, you have a winner. There are so many models out there that aren't as sleek and modern looking as this one, so it's a great purchase to choose. Coming in at a slightly higher price range than other models on the list is the UN55JU6700FXZA model. It has a great picture quality and extra smart features that are sure to take your breath away! Unlike other Samsung and LG models, it has a reasonable sound quality too. However, it does have some flaws which are why it isn't higher on the list than here. The viewing angle from the side is limited and results in a loss of colors (despite having a wide range of colors from front viewing experience! ), and there is a little bit more motion blur than average. Therefore, meaning if you're planning on watching movies or TV shows that are action-packed, you may need to make sure they will work and perform well on the TV before you purchase it. Why We Liked It - Having a TV with a low input lag, and overall great picture quality is ideal for gamers as it allows the game to perform better, and thus you make a lot more wins. If you've got a great TV by your side when you're playing your favorite video games, then you're more likely to win and become better at playing. Anyone wanting a bright TV with great contrast and blacks, this UN55MU8000 model is the perfect purchase choice. It looks super sleek and modern with its chrome finished design, and the stands are located at both ends of the unit. This does mean that it could be too wide for some tables, but the overall support stand for the TV is great. Since it's a thin design, you can mount it on to the wall or leave it free standing - it looks good either way. You can tell this model has a good build quality and is an improvement on other models made by Samsung but for the price you pay, it's not good value for money. The picture quality is good, but it could be better. There are some major flaws with this model which can prove a disappointment. It has a limited color gamut, and the image quality degrades when placed or viewed at an angle. This is something to think about before you purchase it. Why We Liked It - The modern features (such as HDR/high dynamic range) on this model are a huge positive element and should be seen as great. If you're willing to pay out of your price range for this model, then it's a great buy, especially if you want a sleek and modern looking TV in your home. Try the Samsung UN55NU8000 as an alternative. It's important to consider all the factors you can when you're going to buy a 55 inch TV that's under $1000. That way, you can get the most for your money. Specific factors are more important than others and some that don't make a difference to your viewing pleasure. Knowing what to look out for is a huge bonus when you're trying to save some money as it's always great to know the best value for money TVs that are available on the market. We aren't recommending you go for the best 4K smart TV out there. However, if you're paying a high price, then you want a get a good resolution on your TV. The best resolution is 4K with the runner-up being 1080p. Anything below this resolution isn't ideal for a 55-inch TV as the picture quality won't be sharp and crisp. This is especially important for anyone who is interested in getting a good picture on their TV as you may not know what is the best to go for. You don't have to spend much money on a 4K 55-inch TV, and there are even some in our list below if you're interested in finding out more! Certain styles of TV will take up more electricity usage, even when they're turned in the 'off' position. Before purchasing your new TV, you have to be sure that it won't increase your bills too much and they will still stay reasonable. Models will typically have a low energy sticker on them to assure any potential customers that it won't cost you much money to run! Getting a lower energy TV will not mean you're paying more but will, in the long run, save you much money in bills. LED TV's typically use a lot less energy than LCD versions. It's always better to go for a well-known brand. This means that if you have any problems with the TV, you are more likely to get your money back and an excellent customer service process. Not all of the big names have good quality TV's, and this should be thought about when you're purchasing your new TV. If the model has a good reputation and is known in the industry for being good value for money. Then, it's worth trying out. More prominent and popular brands have the service in place to be able to cater for a broad audience, and this is ideal if you've never purchased a TV before and need some help choosing what is best for you. It's got to be the LG 55UH7700 model; it's made it on our list at number 6, so find out more down there. The Samsung UN55KU6500 is possibly the best out there, and that's precisely why it's number 1 on our list of the best 55-inch smart TVs. The Samsung UN55KU6500 wins again, it's a high-quality TV and has a high 4K resolution that is hard to get disappointed about. It's the ideal choice for anyone on a budget under $1000. LED backlit 4K TVs to buy are a higher resolution than those that are LCD and 4K. Even though the resolution is very similar, having an LED included makes the world of difference. When you're choosing which TV to opt for, make sure you consider which you think will suit your home and lifestyle the best. Anyone who is an avid TV watcher might want to pay a little more and go for an LED model over than LCD one. 55-inch TVs have been seen as a sweet mid-range TV screen size for so many families as they're not too expensive and they're still good quality. It's the perfect balance between quality and price range.